Chai-Berry Short-Cup. 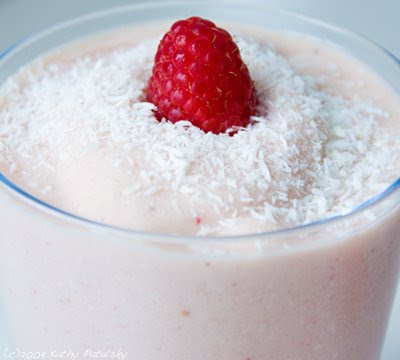 Dessert Smoothie. Vegan. My Chai-Berry Short-Cup will gladly go up against a Strawberry Shortcake any day! 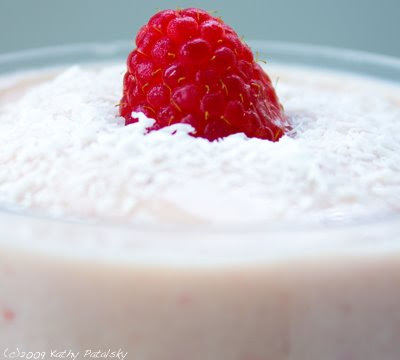 This dessert smoothie is sweet and creamy with a nice punch of nutrition as well. 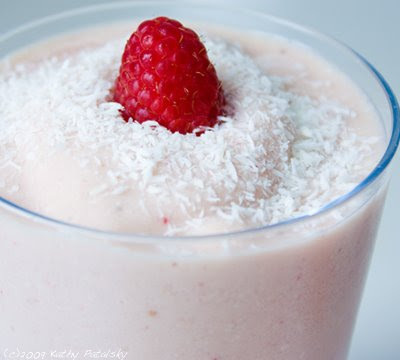 Packed with protein, berry antioxidants and potassium, this smoothie is guilt free! Bolthouse Farms Chai. I used the brand Bolthouse Farms chai in this smoothie. It is a vanilla soy-milk based chai. But if you can't find this exact brand you can easily brew your own sweet/spicy chai, add soy milk and a few dollops of agave syrup. However, I adore the Bolthouse Farms brand for this smoothie. Garnish with coconut and fresh berries. *For an extra icy-creamy dessert treat add a scoop of vanilla soy cream!